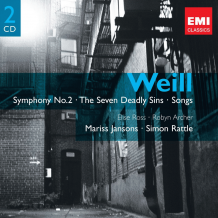 Various Artists - Weill: Symphony No.2, Seven Deadly Sins etc. Weill: Symphony No.2, Seven Deadly Sins etc. ℗ (P) 2009 The copyright in this sound recording is owned by EMI Records Ltd.
© (C) 2009 EMI Records Ltd.